Sure, cerumen may look worse than overcooked beans, but your ceruminous and sebaceous glands make this special recipe for the health of your ears. In addition to effectively removing dust and crud out of your ear canal, ear wax guards your ears against bacteria, fungal infections and viruses. It’s even an effective insect repellant for your ears! It also protects and lubricates the inside of the ear canal to keep it healthy. In fact, these glands whip up a special recipe of cholesterol, sebum, long-chain fatty acids, enzymes, alcohols, sloughed off skin cells, and other chemicals especially formulated for your personal ears—the end result is ear-protecting ear wax. Healthy cerumen is also slightly acidic—which very helpfully inhibits fungal and bacterial growth. Thanks, ear wax! 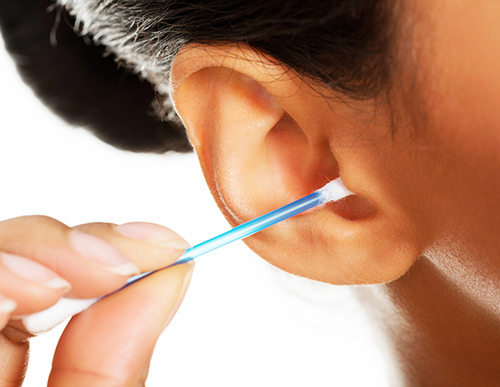 If you’re one of the millions of people who have been using swabs to clean their ears over the years, it’s possible you’ve already suffered some level of hearing loss. That’s because you may have shoved some dirty old ear wax down your ear canal in the swabbing process, clogging your ear canal and blocking hearing. The best thing to do is schedule an appointment with your hearing care professional for a hearing checkup to determine whether or not you have impacted ear wax that might be causing some amount of hearing loss. Impacted ear wax removal should only be done in the office. Also, there are some people who have actual ear wax problems that need to be addressed with ear wax removal—but still not with swabs. Some people’s ears make it too dry or too wet. Sometimes the chemical composition is off and it doesn’t do its job properly. Even in these cases, however, you should still shun sticking anything into your ears besides your elbow for ear wax removal or evaluation. Call your hearing care professional if you’re worried about your ear wax. Note about hearing aids: ear wax buildup can lessen the effectiveness of your hearing aids, if you wear them. Improper hearing aid cleaning can also cause ear wax jams. So it’s very important to follow any hearing aid cleaning and gentle ear washing instructions that your hearing care professional gives you. It’s important for parents the world over to understand that ear cleaning is not necessary like brushing your teeth is! Every day, somewhere in America, 34 kids are rushed to the doctor with ear cleaning injuries. Unfortunately, these injuries sometimes cause hearing loss that impacts the child’s language and communication development. So teach your kids not to put anything in their ears except their elbows (and then giggle as they try to do it). But seriously, the most common of these ear injuries include tympanic membrane tears (torn ear drum) or other small lacerations and cuts inside of the ear canal. We hear some of you out there thinking out loud about “ear candling”. Nobody knows exactly who thought of sticking these hollow cones into your ear and setting them on fire, but we’re here to tell you—it doesn’t work, and it’s dangerous. So don’t do it. People across the country end up in the doctor’s office with ear candling injuries every year. So just… don’t do it! Showering. Really, just take your shower and wash your hair. Afterwards, just gently dab around your ears with a towel to sop up any excess water and you’re good to go. This will safely remove only the spent ear wax that your chewing, talking and yawning have evacuated from the ear canal. Seriously – don’t pick up another swab! If not cleaning your ears the wrong way makes you feel awkward, or if you have any other concerns about ear wax impaction, ear injury or hearing loss, please schedule an appointment with your hearing care professional for an ear checkup today.